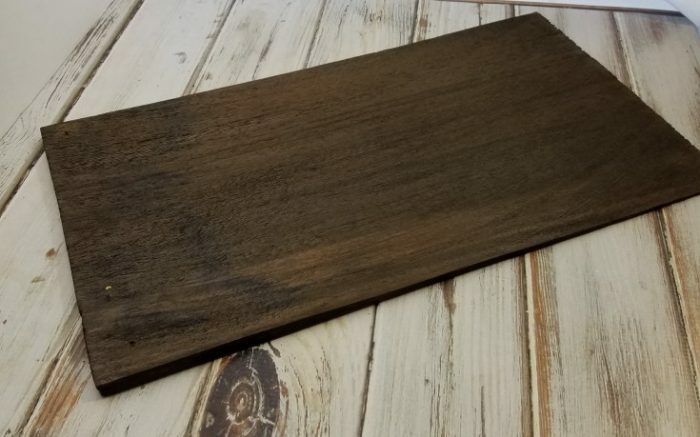 Years ago, when I first got into woodworking, and painting on wood I had my cousin save me some of the old wood shingles that she was having removed, and replaced on her roof. I still have a small stack that I pull from when inspiration hits. 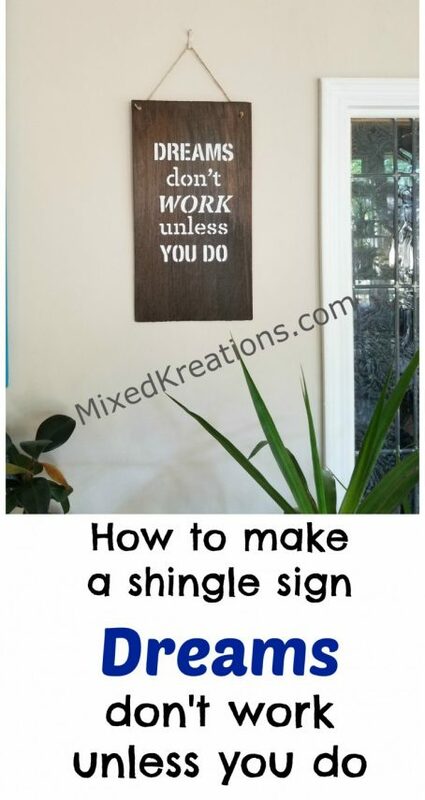 Like this shingle sign Dream Don’t Work Unless You Do! When I ran across a pack of 25 stencils at Walmart for $10.00 I just couldn’t pass them up. 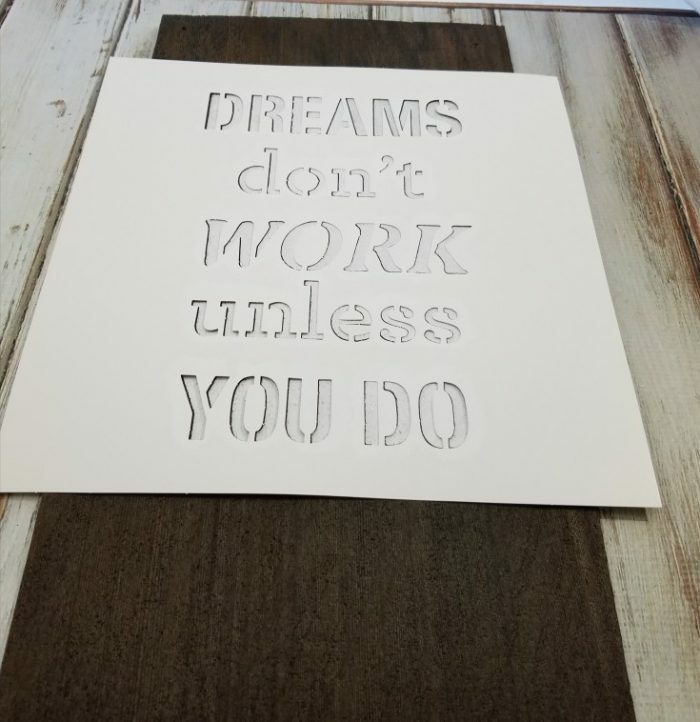 I thought that a wooden shingle would be perfect for one of the stencil quotes, that is if I had one left that was large enough. I was in luck, I did have one large enough for the quote shingle sign. So, I pulled it out and used my sanding block to smooth the shingle down enough to stencil on. I wanted the shingle darker so, I used some of my homemade aging solution to darken the shingle. Then I centered the stencil on the shingle. When centering makes sure the thicker part of the shingle is up at the top, then stencil the quote using white acrylic paint. Since shingles are too thin to add a sawtooth hook I drilled two holes at the top of the shingle sign, on each side. Then added a piece of twine for hanging. Great Quote! It makes me think of the dreams for my blog, and for dreams to come true one has to work at it. They don’t just happen. My Dreams help to keep me going. 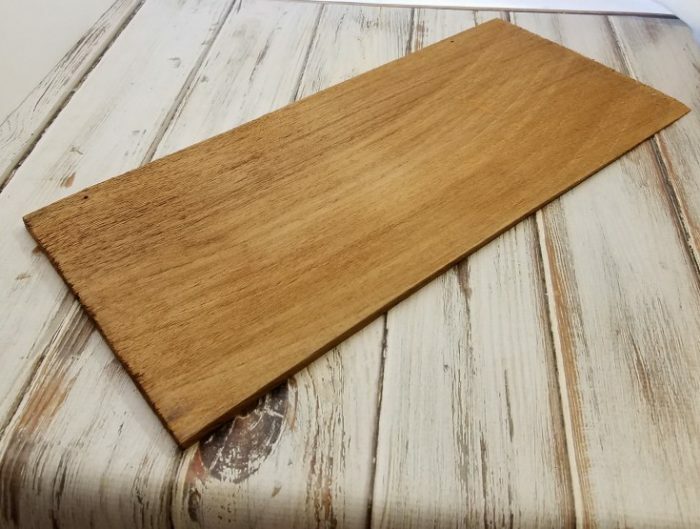 More Projects You May Enjoy! I love that quote and it’s so appropriate for me right now. I need a sign like this to hang next to my bed, just as a reminder when I wake up every morning. 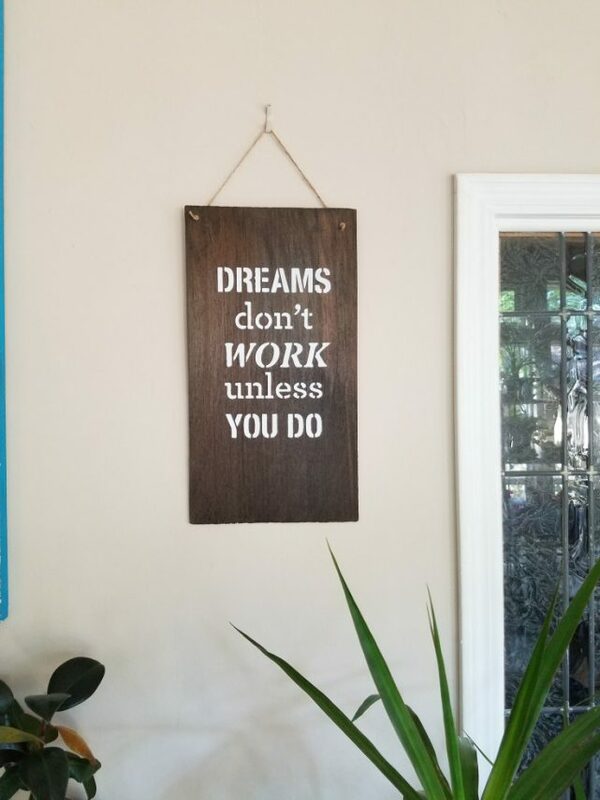 Great quote and it looks beautiful on this piece of wood, Linda. You got an amazing deal on that pack of stencils. Thank you Julia! I know I just couldn’t pass them up. They are made from cardboard, but if I’m careful they should still last me a long time. Thanks for stopping by! 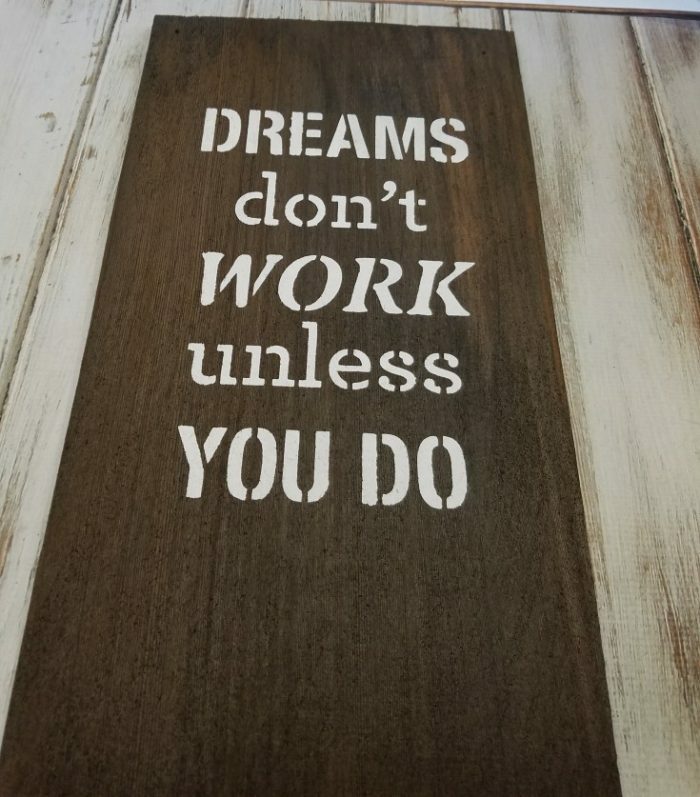 What a fun quote and so inspirational for us who like to DIY! It really speaks to me, especially now that I have a pile of stuff I need to get done! I could use one of these with this saying too! Love your plaque…it would be a sweet gift too. Pinned! Thanks Wendi! I love this saying, it would be great it some of the younger generation would wake up and realize this. LOL Thanks you so much for pinning!